Ross "Farmer" Ditchburn was a tall, long-kicking forward from country Western Australia who topped Carlton’s goal-kicking list in 1982, played in a Grand Final, was knocked unconscious – and still picked up a Premiership medal. He spent just two seasons with the Blues, yet left his mark in 28 games that produced 91 goals. In 1981, Ditchburn was the 24 year-old captain-coach of his hometown football club at Kukerin, in WA’s wheat belt south of Perth. His family were pillars of the local community and ran a large property outside the town. He had played WAFL football at Claremont, but by then Ross was a star of the strong local league; a powerful key forward with vice-like hands and a right foot that could, the locals said; “boot a bag of spuds over a wheat silo”. One day, the Ditchburns had visitors – all the way from the other side of the country. Carlton coach David Parkin and Recruiting Manager Shane O’Sullivan had come to Kukerin with an offer that the big bloke found tough to resist, and that his parents encouraged him to accept. After tea and scones in the Ditchburn’s kitchen, Parkin and O’Sullivan left with the promise that Ross would be at Princes Park the following year. The Blues were Premiers of the VFL in 1981, still Parkin was concerned that the team lacked a consistent, reliable full-forward, so he decided to give Ditchburn every encouragement to fill that breach in the ’82 team. 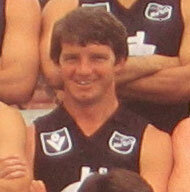 Ross was allowed to find his feet in the Reserves for seven games, before making his senior debut – wearing jumper number 8 - against Footscray. Most fans were less than impressed with his early efforts, but Parkin never lost faith in his project player. Then in round 15 against Melbourne, it all clicked for Ditchburn when he hit form at last. His 6 goals, 3 behinds from a dozen strong marks was a solid indication of his ability – and there was more to come. The following week against St Kilda, Blues’ fans went into raptures as Ditchburn dominated the game with a club record 12.2 from 14 shots in a best on ground performance. Carlton finished the gruelling 22 rounds of the home and away season in third place, then faced up to Hawthorn in the Qualifying Final. After an even first half, Carlton blitzed the Hawks with 11.2 in the third quarter of that match. Ditchburn finished with six goals. Unfortunately for the Blues, Richmond handed out the same treatment to us the following week in the second-semi-final, kicking 6.6 to 2.0 in the first quarter to eventually win by 23 points. Therefore, in order to make their second successive Grand Final, the Blues had get over Hawthorn yet again in the Preliminary Final. This task was accomplished, but only after a torrid physical battle won by the ruck dominance of Carlton’s Warren 'Wow' Jones and captain Mike Fitzpatrick. Richmond started strong favourites in the ’82 Grand Final, and from the first bounce employed their by then customary tactics of all-out attack on the man and the ball. Ditchburn was one of the early casualties. Late in the first quarter, he was accidently kicked in the back of the head by a Richmond defender, and the rest of the day was a blur as the Blues met fire with fire in one of our most courageous victories. Wayne Johnston, Bruce Doull and Fitzpatrick were simply magnificent in Carlton’s gutsy 18 point win. To add to his Premiership medal, Ditchburn also collected the club goal-kicking award with a tally of 61 majors. Season ’83 proved something of a letdown for both Ditchburn and the club. Late in the year Ross learned that his father had fallen ill and was struggling to cope with the demands of running their property. Coincidentally, his form tapered off and he began spending time back with the Reserves team. After discussions, Carlton agreed to release him at season’s end. His last game was that year’s Elimination Final against Essendon, which Carlton lost by 33 points. Ross returned to the farm and the Kukerin Football Club, where he went on to play and coach for a number of years. Still running the family farm, he was elected as a Shire Councillor for Kukerin in 2004 (pictured below). Contributors to this page: Jarusa , Bombasheldon , molsey , PatsFitztrick , WillowBlue , pblue , p(12)terg , wolfister , true_blue24 , nikki and admin . Page last modified on Thursday 11 of May, 2017 22:25:05 AEST by Jarusa. 1888 - English Tour Fixture.